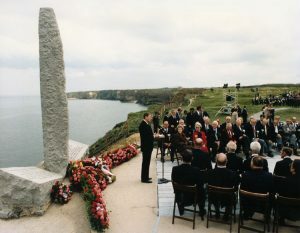 US President Regan giving a speech for the commemoration of the 40th birthday of the D-Day at Pointe du Hoc. The Pointe du Hoc is the highest point between western Utah Beach and eastern Omaha Beach. From this point, you can overlook the English Channel. This lookout provides a great view of the coast of Normandy. 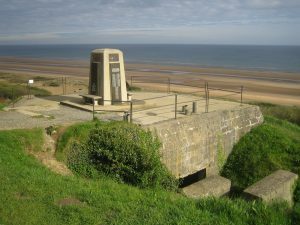 Because of its’ particular location, the Germans placed heavy artillery (gun pits) on the cliff, threatening both Omaha and Utah beach. It was then considered an essential mission to blast the German artillery immediately when Operation Overlord began to protect the landing troops and reduce casualties. On D-Day, the U.S Army attacked and took over Pointe du Hoc after scaling its cliffs. Unfortunately, they discovered the artillery had recently been taken to another location. Sainte-Mère-Eglise was the first town of France in the Cotentin region liberated by American paratroopers. 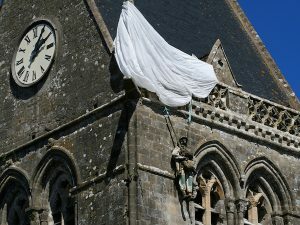 It is also famous for the American paratrooper, John Steele, who’s parachute was caught on the church tower during the Overload operation. You can see a copy of John Steele still attached to his parachute on the church tower. There is a museum dedicated to American paratroopers called Airborne Museum. It is located just in front of the church. This museum takes you back to D-Day alongside American paratroopers. 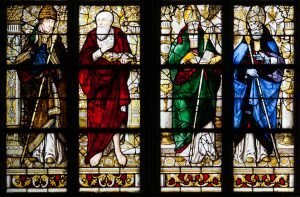 Also, admire Sainte-Mère-Église with its special atmosphere full of history. Omaha beach was one of the landing beaches assigned to the Americans for landing in France on D-Day. This is where they suffered the most casualties while fighting against Germans troops in hopes of liberating Europe (30% of all casualties of the D-Day). Hence the name « Bloody Omaha » or « the Beach of blood ». The name Omaha was used as a code name during Operation Overlord, chosen because it was the place of birth of one of the officers engaged in the operation (the city of Omaha in Nebraska). The same with the other American beach, Utah beach, state of birth of another American officer. 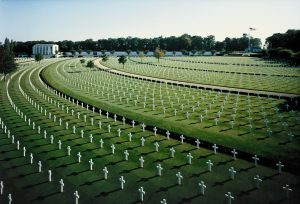 Located a few meters away, the American cemetery of Colleville-sur Mer overlooks the beach. 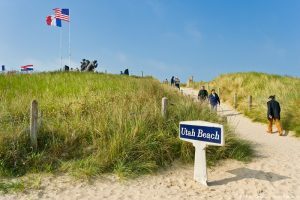 Utah beach is the most western of the five landing beaches during WWII. It was used for amphibious landings undertaken by the United States Army troops. The code name comes from the name of the US state from where one of the officer participating in the landing was from.